All right, let's get started with the first batch of players who have worn the Number 10 while smacking around a few balls for the Tribe! As in the past, I will post more #10's in the upcoming days! Alvaro Espinoza - 4 seasons (1994-96) - Espinoza came to the Tribe from the Yankees. In 1995, he was granted free agency by the Indians, but then was re-signed. Though he served as full-time SS in '94, he ended up being backup SS and 3B. 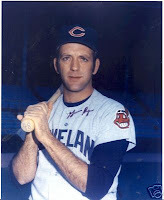 In his career with the Indians, he had 749 plate appearances, scoring 88 runs on 189 hits, 36 double, 2 triples, and 11 home runs with 74 total RBIs. He came to the Tribe batting .278 his 1st years, and left the Tribe batting .223. He had one at-bat in the '95 Division series but got nothing for it. He went 1 for 8 in the ALCS that year, and batted .500 (1 for 2) in the 1995 World Series. 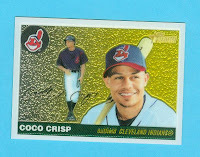 Coco Crisp - 4 seasons (2002-2005) - Crisp came to the Indians in a trade with the Cardinals for Chuck Finley. I was always a fan of Crisp, honestly because his name reminded me of breakfast cereal - don't ask, just smile and nod your head. Of course, he was pretty good as a Triber, too. In four seasons, he had two perfect fielding percentage years and the other two were around .988. Batting-wise, in 415 games, he batted 1,626 times with 235 runs on 467 hits, 90 doubles, 14 triples, and 35 home runs. He brought in 176 RBIs, was walked 114 times and struck out almost as often as he scored runs (220 strike outs). His batting average improved each season, starting at .260 and ending at .300 as an Indian. Overall, Crisp hit for a .280 average in a Tribe uniform. 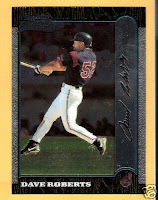 Dave Roberts - 3 seasons (1999-2001) - Roberts basically served as backup utility fielder for the Tribe during his stay in Cleveland. During his rookie year, he had 143 at-bats and scored 26 runs on 34 hits. When he hit the ball, he was pretty likely to score a run. That seemed to be the issue though, as he garnered only a .238 average his first year. He went 0 for 3 in the Division Series that season, and the next season, his average fell to just .200 (2 hits in 10 at-bats). In his final season with the Indians, he brought his average up to .333 by getting 4 hits in 12 at-bats. George Uhle - 11 seasons (1919-1928,1936) - Uhle only wore #10 during the 1936 season, but remember, it was not until the 30's that teams even bothered with uniform numbers. So, for the sake of argument, I'll looking at his entire career as a Tribe pitcher. In his rookie year, he pitched 7 complete games (out of 26 total games in which he pitched), started 12 games and went 10-5 for a .667 W/L record with an ERA of 2.91, only giving up 1 home run. He pitched three innings in the 1920 World Series, striking out three batters and allowing no runs for a perfect 0.00 ERA. Unfortunately, his batting average for the Series was the same... Overall, Uhle pitched in 357 games as an Indian, starting in 267 of those, he had 147 wins and 199 losses for a career W/L percentage of .488! That's nearly a 50/50 ratio over 11 seasons. He had 16 shutouts, gave up 2,442 hits and only 58 home runs, though he did give up 989 earned runs and 1,137 runs overall. And, one of my favorite stats: he pegged 95 batters with the ball during his career... :-) As a batter, he actually did better than what most folks would think for a pitcher... In fact, several season he did better than most players would: How about NINE seasons with .250 or better and five of those were .300 or better! In 960 at-bats during his career, he had 277 hits, 45 doubles, 16 triples, and 5 home runs on 277 hits. He brought in 140 runners, was walked 65 times, and was hit by the ball 4 times (guess the other pitchers were afraid he'd retaliate if they hit him!). He ended up with a .297 overall batting average for the Tribe. How's that for "Pitchers can't hit?" Gomer Hodge - 1 season (1971) - Unfortunately, sometimes we live up to the names we are given... 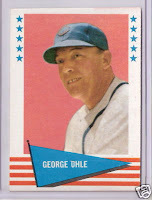 Here is a quote featured on baseball-almanac.com: "Mobbed by reporters eager to find out from (Gomer) Hodge how it felt to be 4-for-4 in his career, the affable rookie proclaimed, 'Gollee, I'm hittin' 4,000!'" - Columnist Chuck Murr in Indians Ink (May 14, 2007). Evidently, the 4-for-4 was not something that stuck around long. In 83 at-bats, Hodge had 17 hits with 3 runs, 3 doubles, and one home run. He struck out 19 times and managed to get beaned twice. I don't know what happened to his career after his only season in the Majors, but he left The Bigs batting a .205 average. He passed away in 2007 with ALS (Lou Gehrig's Disease). Hank Helf - 2 seasons (1938,1940) - Helf wore #10 his rookie year then switched to #40. He served as catcher in six games his rookie year. He had 13 at-bats with 1 run on as many hits with an RBI. He finished the season batting .077... Ouch.